Does Bill Green Want to Skip the Mayor’s Race and Run for Congress? The rumor mill is churning. By Victor Fiorillo·	 3/5/2013, 12:34 p.m. 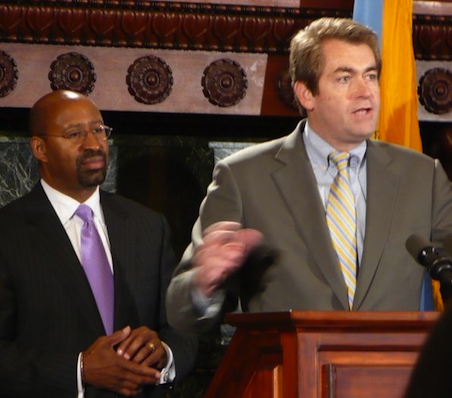 Whenever the subject of Philadelphia’s 2015 mayoral race comes up, the one person who is always named first or second in the pack of candidates is Councilman-at-Large Bill Green, whose father, Bill Green III, held the seat in the early ’80s. But this week, there’s chatter in political circles that the councilman has set his sights on a new target: Congress. In the last couple of weeks, Congresswoman Allyson Schwartz has made it quite clear that she intends to run for Pennsylvania governor in 2014. If she does, she will likely not seek reelection, leaving the November 2014 Congressional race open for a Green bid. The Congressional move would not be without its own historical precedent in the Green family. The councilman’s father served six terms in Congress prior to becoming mayor. And Green’s grandfather was also a member of Congress. He held a seat for 19 years until his death in 1964. Councilman Green doesn’t actually live in Schwartz’s district, the 13th Congressional District, but he doesn’t have to, according to the U.S. Constitution. So what of Green’s mayoral aspirations? Well, the 2015 mayor’s race is no sure bet. If Councilman David Oh can succeed in getting Philadelphia’s longstanding resign-to-run law struck down, thereby allowing sitting elected officials to run for office without giving up their current jobs, the 2015 field could be a crowded one. District Attorney Seth Williams, Councilman Jim Kenney, State Senator Anthony Williams and City Controller Alan Butkovitz are among the potential Democratic contenders.